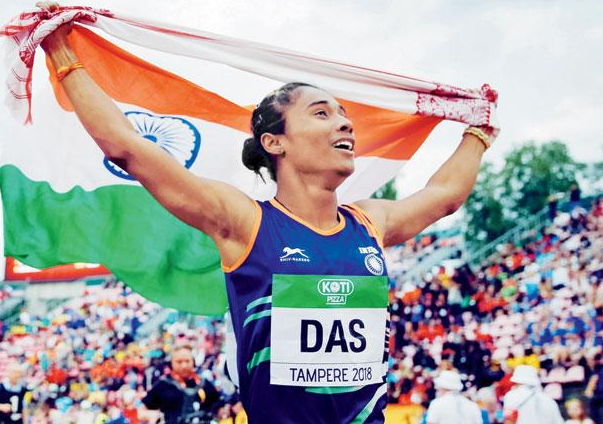 An 18 years old, Hima Das, an Indian girl from Nagaon District of Dhing village who has currently shaken the world by winning the Goal medal in Women's 400m race at the IAAF World U-20 Athletics Championships held in Finland on Thursday. She is also the first Indian to win gold medal in a track event at the World level. Talking about her family background, Hima is the youngest of five siblings from her parents Ronjit das, Father and Jumali Das, Mother. Her Father is a Farmer and Her Mother is a Housewife. Her Father holds 0.4 Acres of land which was only the source of Income for their family which was very hard life to live. Hima's educational qualification is Intermediate passed out. She told from Finland, "I know my family's situation and how we struggled but the Almighty has something for everybody. I am a positive person and I want to look ahead in life and want to do something for my parents and also for the country". In addition to this she also said," I am living a dream". "She is stubborn girl. If she wants to do something, she will not listen to anybody but she will do it calmly. She is a very strong girl. That's why she is coming up to achieve something", said by her father, Ronjit Das. While she was playing football in a muddy field at her village, one of her school teacher saw her pace. Then, the same teacher advice her to take up athletics. Soon, Nipon das spotted her. Nipon das is an athletics coach of inter-district. He asked Das to transfer to Guwahiti, which is 150 Km from her village. He then convinced that she had very bright future in Athletics. At first, her parents are hesitating but later they were convinced. Das was trained at the Indira Gandi Athletics stadium at Sarusajai Sports Complex, Guwahiti. There, she won the gold medal in the 400 meter race of the Federation Cup in Patiala in March to qualify for the Commonwealth Games. She finished to sixth position in the Common wealth games 400m finals, then lowered the Indian U-20 record in 400m to 51.13 Seconds. In the Ratina Stadium, She was running in lane four. She stormed victory in 51.46 seconds, beating Andrea Miklos who was at distance of 52.07 seconds. Andrea Miklos of Romania became Second in overall time charts of 52.58 second.